High quality foods, cages, nesting materials, supplements, accessories and toys for Canaries and Finches. We have a wide range of foods, cages, toys, accessories, vitamin supplements and nesting materials so you can provide your pet Canaries and Finches with the best possible care they need. Supplied by all major brands. Canaries are famous for their ability to vocalize more freely and beautifully than most birds. Finches are known for their extraordinary colours and markings. Both birds together, are impeccable and serve as wonderful pets for those who know how to take care of them. When looking for what your Canary or Finch needs, you’ve found the right spot. We offer cages, accessories, foods, and more. 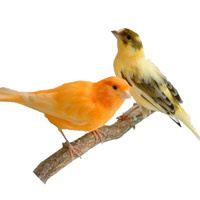 Your Canary and/or Finch needs a cage large enough so they can interact, eat, and find solace when they’re resting. Go big and give your bird the most beautiful and fully functional homes with our variety of European made cages. We feature stylish and eco-friendly cages that come in different sizes, their own perches, pull out trays, and feeders. When providing for you bird, the best thing you can do for them is offer them a delicious and nutritious diet. This in turn helps your Canary and/or Finch look and feel their best. We offer high quality food made of fortified seed mixtures that are made with top grade seeds. When you’re needing to give your Canary and/or Finch a dose of nutritional power ups, we have the perfect supplements. Lastly, we offer snacks and treats for your little-winged birds like, edible bark rolls complete with a mixture of delicious seeds, parrot treat packs, and foraging fruit racks. Give your Canary and/or Finch some fun filled playtime with our great selection of toys and stands. Try our Big Mirror Perch and give your birds home a little upgrade. Whatever you choose, bird lovers are sure to find a variety of entertaining toys to keep their beloved Canary and/or Finch entertained. Not only do we provide Canary and/or Finch owners the basics for caring for their birds, we also offer many accessories one might not think to have. Browse our unique selection of accessories like; safe cleaning products, paper liners for travelling, or even small transport boxes for when you’re taking your companion on vacation with you.